Objective is to bring together the Pi and Lego to make a Robot Rover. Lego motors have proprietary connectors so have decided to get some spare cables which can be cut. However, need to learn some basic robotics first. 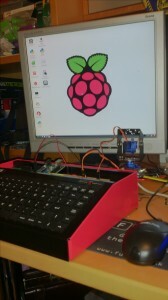 Therefore I have ordered a simple rover kit from Dawn Robotics http://www.dawnrobotics.co.uk/raspberry-pi-camera-robot-chassis-bundle/ which I have assembled without too much trouble but now to address the programming. I have my FUZE (Powered by Raspberry Pi) set to do programming and I have added a pan-tilt test rig made out of Meccano to explore how to program it. See progress with programs page. So, the Mini Driver board is not accepting instructions – diagnosis bad bootloader, remedy- reflash a new one from Pi or another Arduino. Instructions received from Alan Broun at dawn Robotics so hope to get to it in a day or so.